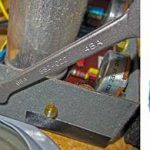 If you are working with BA fasteners then turn to Laser Tools – this new BA socket and spanner set (part number 7132) covers the most commonly used sizes. BA (British Association) screw thread sizes cover a range of small screw thread, originally being specified at the end of the nineteenth century as the British standard fastener for small electrical devices and scientific equipment. The design of the BA thread profile lends itself to low-torque applications. They are used for miniature instruments, clocks, optics, moving coil meters, conduit boxes, micro applications and modelling. BA fasteners can still be found on classic cars right up to the early 1970s on speaker enclosures and instrument panels. This useful set from Laser Tools incudes eleven ¼in -drive sockets manufactured from tough chrome vanadium steel: OBA, 1BA, 2BA, 3BA, 4BA, 5BA, 6BA, 7BA, 8BA, 9BA and 10BA. The six open-ended spanners are sized at 0BA x 2BA, 1BA x 3BA, 4BA x 6BA, 5BA x 7BA, 8BA x 10BA and 9BA x 11BA. Print article This entry was posted by admin on November 2, 2018 at 10:32 am, and is filed under News. Follow any responses to this post through RSS 2.0. Both comments and pings are currently closed.